Sunday night featured what may have been the game of the season. 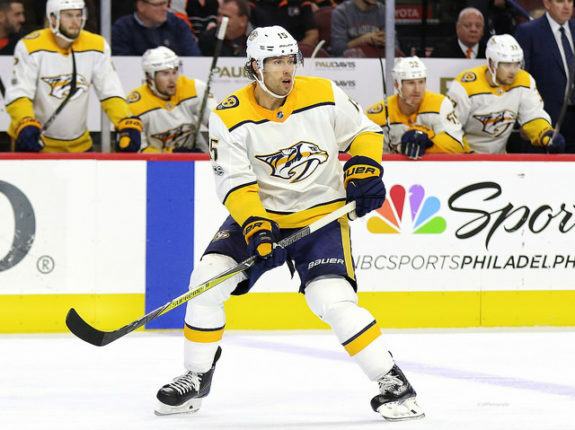 The Nashville Predators traveled to Winnipeg after a rough loss to the Minnesota Wild for their second game in 24 hours. 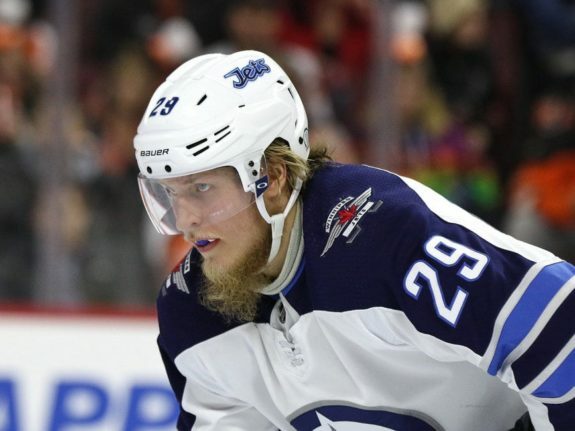 They would find no solace in the “true North,” as the Jets were seeking vengeance. The Jets won by a score of 5-4 in a shootout victory that is sending them back to the playoffs. It was clear from the puck drop that the Predators were tired, as the much of the offense looked to be skating through mud, although one player stood tall. Goaltender Juuse Saros played one of, if not the best, four-goal game I’ve ever seen. The tiny netminder was on his own for most of the night, and this game could’ve easily been a blowout had the promising Finn not stood tall. I understand that the Predators were tired and have now played three games in four days, but the Predators were absolutely terrible. The second period especially was bad, but overall it wasn’t pretty. Seeing might be better than telling, so let’s go to the chart below. For reference, we’re using unblocked shot attempts (Fenwick), scoring chances (SC), high danger chances (HDC), and goals. All stats are even strength. The only stat that the Predators won was goals, which is ultimately the one that matters most, but some of the goals were a bit weak. Only Viktor Arvidsson’s goal came from the high danger area, but that was a broken play after the Jet’s goaltender couldn’t handle Ryan Johansen’s shot. 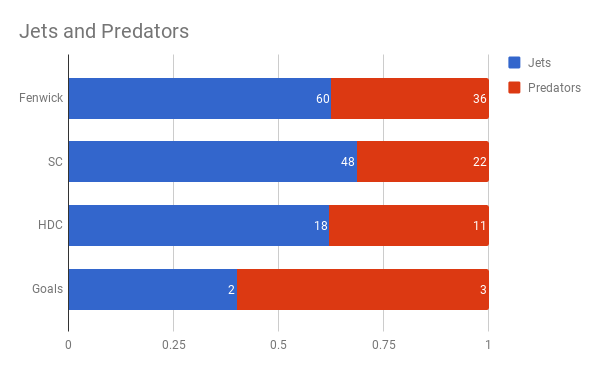 Otherwise the Predators never really won the high danger fight, and put up their highest amount of four in the second period. Meanwhile, the Jets never had less than five high danger chances in a period, except for the overtime period. Scoring chances make it look even worse as the Jets doubled the Predators’ amount. I think this stat best described how the game felt, as the ice seemed extremely tilted through the entire game. For every chance the Predators produced, and some of those chances were barely chances at all, the Jets would coming storming back. The Predators’ biggest issue was their zone time. They failed to control the pace and they never really established possession in the offensive zone. Usually, the Jets would just box them out until a defenseman was forced to take a bad shot from the point, where the Jets would then freeze the puck or get the breakout started. The Predators have relied on the rush for scoring over the past few games, and it’s very clear that it doesn’t work. Pekka Rinne is a Vezina Trophy favorite, and his backup, Juuse Saros, is no slouch either. I think it was a mistake to throw Saros to the wolves tonight, but he was certainly impressive. As I said earlier, this was probably the best goaltender performance I’ve ever seen where a goalie has given up four goals. Only two goals came at even strength, with the other two coming on the power play. And there were plenty of power play chances, as the Predators looked tired and slow compared to the rested Jets. Saros ended the night with 43 saves on 47 shots, that culminated in a .915 save percentage. When we only take into account shots at even strength, Saros was even better with a .950 save percentage. Things couldn’t have been worse for Saros, yet he kept his calm and never looked out of place. 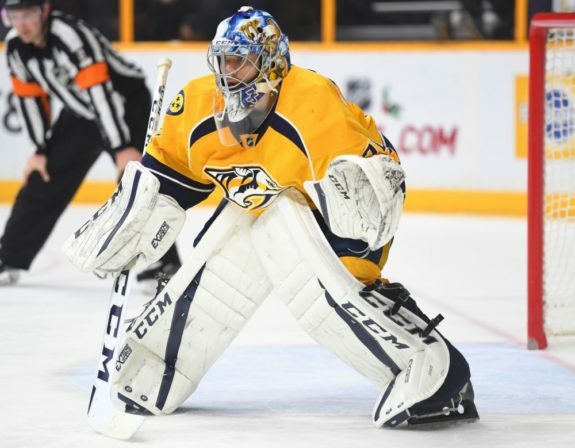 He’s giving many fans a safe feeling for next season and the season after when Rinne will be taking a smaller role in net. The Predators didn’t play well, but Saros did. The belle of the ball from the first half of the season is starting to turn back into a pumpkin. 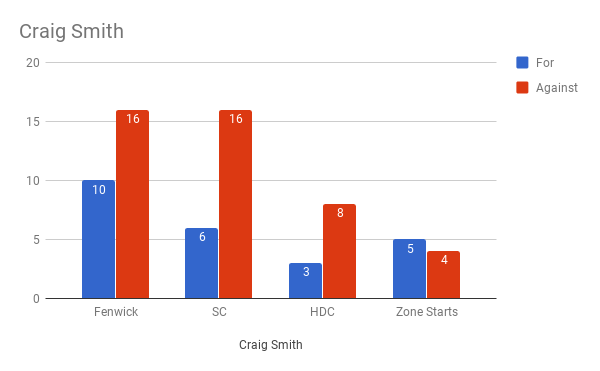 The last few weeks have featured some vintage Craig Smith, as he’s missed countless nets and just been generally invisible. Smith may as well have been transparent as I lost track of him multiple times, and the stats reflect it. For reference, we’re using the same stats as before, except we’re substituting goals for zone starts for (offensive) and against (defensive). It wasn’t pretty and something that the stats don’t show, is the number of shots that Smith missed on. I don’t think he made a solid connection on any of the three attempted one-timers, and two were from dangerous areas. It just wasn’t his game as he looked slow and tired. His passing was sloppy, his breakouts were weak, and there really wasn’t a physical presence at all. I’ll just chock it up to a personal slump, but that has to break if the Predators want to go far in the playoffs. Inconsistency is a killer of depth scoring, and it has its claws wrapped around the right winger. The Predators get another crack at the Minnesota Wild on Tuesday night, as this matchup will be in Tennessee. Eric Staal and the Wild will look to punch their ticket into the playoffs while the Predators will attempt to bust their slump. This very well could be another first-round matchup and should be a fun game.